The is the third book I have read by author Karen Kilpatrick and each one just gets better. As with Ella's Toys and Danza's Message, Karen lays it on the line with some great character development skills. 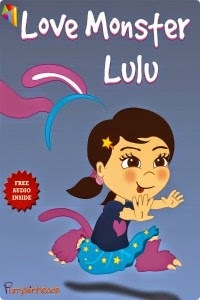 Lulu is a rambunctious little girl that has a enormous love for all animals. Pretty much like every little girl! Lulu though does not understand that there is such a thing as showing too much love in the wrong ways. She really reminded me of Elmyra from Looney Tunes. I kept thinking of the phrase" I am gonna kiss them and hug them and make them my very own." Much like Elmyra, Lulu just wants to know that she is loved and accepted. My daughter, 15, thought Lulu hit a true desperate point when she went searching for her brother to love on! lol. Without a doubt Lulu has her love language down. She craves the affection and time of the ones she loves most. This was another wonderful children's book that is filled with a beautiful message, the importance of family, showing love and caring for others. Gorgeous illustrations help bring this book to life and capture your child's attention. Thick pages, bold colors and words using different font will appeal to the visual learners out in the world. Another winner.